When someone drops a winch handle, spinnaker pole or outboard shaft on a fiberglass deck, it will sometimes produce a minor ding in the gelcoat and fiberglass. Fortunately, most of these dings are relatively easy to fix. Here’s how. To repair a minor ding or hairline crack, first use a Dremel tool to smooth the gelcoat surfaces down to the fiberglass. Remove any loose gelcoat or antiskid material, then use acetone and a clean rag to clean the area and remove any mold-release wax that may still be on the surface. Next, mix a batch of epoxy and add a small amount of colloidal silica and fairing compound until it has the consistency of peanut butter. Use this epoxy paste to fill the damaged area and when the epoxy has cured, sand the area smooth. Deeper holes need more than just filler, because over time the filler will crack and fall out. Use a combination of 1 1/2 oz. fiberglass mat and 6 oz. cloth to make these bigger repairs. First measure the depth of the hole, then draw a circle around its center with a radius eight times the depth. Use a Dremel tool to evenly feather the depression up to the outer edge of the circle. Next cut out a circle of mat and a circle of cloth. Give these circles the same radius as the circle you have drawn on the deck. Continue cutting mat and fiberglass circles making the diameters of the succeeding circles 1/2 inch smaller than the previous pair. Keep cutting circles until you have enough material to fill the hole. Then cut one more circle from the glass cloth with the same radius as the first. Use a straightedge to determine when all the mat and cloth layers are flush with the surrounding deck surface. To fill the hole, first mix a batch of neat epoxy—with no filler—and wet out all the circles. Then mix another batch of epoxy, adding colloidal silica and low-density fairing compound until the mixture again has the consistency of peanut butter. Spread this second batch of epoxy over the entire surface of the hole being repaired and then start filling the hole with the cut circles. 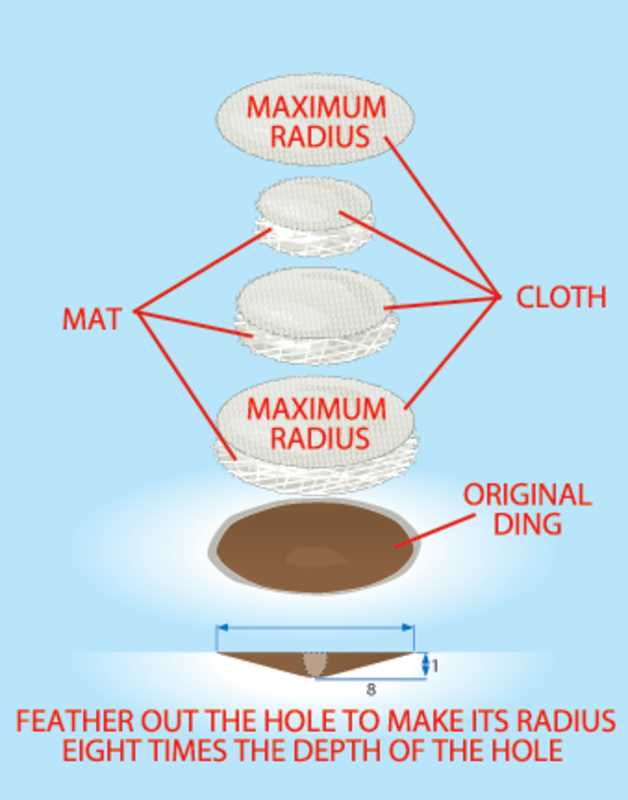 Begin by placing the biggest circle of mat on the bottom and the same-sized circle of cloth right on top. (In this repair, the mat fills the cavity and the cloth creates structural strength.) Squeegee out the air bubbles and continue placing smaller mat and cloth circles in the hole. Squeegee every layer before proceeding to the next. The smallest mat and cloth circle will be the upper layer. Finally, cover those two top circles with the cloth circle that is the same radius as the repaired hole. Flatten the surface with the squeegee and cover with a sheet of polyethylene. Although exact curing times depend on the hardener you are using and the temperature and humidity, for best results let the repair sit overnight. After the repair has cured, peel off the polyethylene and wash the area with acetone to remove any amines that might have been released during the curing process. Sand off the high spots, and if any low spots remain, mix a batch of epoxy filler and use it to fill them in. Let the epoxy cure. Continue sanding and filling until the entire repair is flush with the rest of the deck. Wait three to five days before painting the repaired surface. It never hurts to clean the area again with acetone to remove any amines. Before you start painting, be sure to wash the area with clean water. If your deck has a painted antiskid finish, redoing a small section around the repair doesn’t make much sense because it is nearly impossible to match a paint color that has been faded by the sun. If you plan to cover a much larger area, first tape off the section you plan to paint. Next, prime the section—we like to use a two-part water-based epoxy primer. When the primer has cured, wash the surface with an ammonia-and-water solution. A quarter cup of ammonia in a gallon of water works nicely. When using sand to create an antiskid surface, put the sand on the paint rather than in it. Several different types of sand work well, but don’t try to save money by using common beach sand. The salt is difficult to remove and so are all the other bits and critters in beach sand that will make it far more difficult to get good adhesion. In addition, the grains will not be uniform and this will affect both the aesthetics of the finished product and the effectiveness of the antiskid surface. Considering the time and effort involved, do yourself a favor. Do it right, with commercial sand. Here again, a two-part water-based epoxy paint works well. After the paint has been applied sprinkle the freshly painted surface with sand. After the paint has cured, rub a piece of wood over the surface to knock down any high spots. Then remove the loose sand with a vacuum or brush. Apply a second coat of paint and if necessary, sprinkle on some more sand and put on another coat of paint. Plan to use about twice the amount of paint you would use on a smooth surface of the same area. Remove the masking tape before the second coat has hardened completely; this will allow the edges of the paint to soften a little. When everything is fully cured the antiskid surface should be smooth and fair. To repair a gelcoated antiskid surface, roll on a fresh layer of gelcoat and wait for it to become tacky. Then go over the surface again with the same roller to pull the gelcoat up in a random pattern of peaks. To find the optimum length of time to wait before rerolling the gelcoat, experiment on another surface. A gelcoat that has wax added to it helps ensure a good cure. Matching a molded gelcoat antiskid pattern is not easy and should be attempted only if one is very familiar with the materials. If that’s the case, patterns and detailed instructions for a variety of styles and sizes are available from Gibco Flex-Mold (gibcoflexmold.com). Repairing a molded antiskid deck calls for a different approach. First mix a small batch of epoxy and filler until it has the consistency of mayonnaise. Next, put the batch in a sandwich bag, cut a very small hole in a lower corner of the bag and “decorate” the deck with tiny dots, much as one decorates a cake. Another way to get stippling between the dots is to dip the tip of a small disposable bristle brush in the epoxy and then touch the deck surface with it. For best results practice this maneuver on a test platform before trying it on the real surface. When the surface has cured, prime and paint. Whether you are repairing a ding, filling a bigger hole or repairing a section of worn out antiskid, the goal is to make a repair that is not only waterproof, but also attractive and safe. If you prepare the surface well, plan in advance, and schedule enough time to do the job right, the result should be a handsome and professionally finished surface. To keep heat from your hand from speeding up curing, hold the mixing pot at the top rather than at the bottom or sides.